Daryll B. DeWald became the fourth chancellor of WSU Spokane on Sept. 1, 2017. An experienced academic leader and a successful life sciences researcher, DeWald is passionate about higher education and providing avenues for students, faculty, and staff to succeed. In his progressive roles as student, researcher, professor, dean, and now chancellor, DeWald has readily taken on the challenges of understanding how various processes can influence, encourage, and regulate growth—both in organisms and in organizations. As a first-generation college student at the University of Wyoming, DeWald found a job assisting faculty in a biochemistry lab, which led to opportunities to design his own research and, in turn, to publish several scientific papers. After earning his bachelor’s degree, DeWald spent five years as a research scientist with the pharmaceutical company Upjohn. He flourished in the private sector, but found it lacked the inspiration and creativity of an educational environment. He left industry in 1988 to pursue a Ph.D. in biochemistry at Texas A&M. DeWald earned a postdoctoral appointment with the UC San Diego medical school where he was fortunate to work and learn alongside a stellar cohort of scientists; the program included a Nobel Laureate, several National Academy of Science members, and his mentor was a Howard Hughes Medical Institute investigator. The experience reinforced his desire for a career in which he could blend scientific inquiry with teaching and mentoring students. During his 15-year tenure at Utah State University, DeWald researched how lipids regulate cancer cell metastasis and control cellular communication during plant stress acclimation. He has authored or co-authored nearly 60 publications in a wide variety of journals. He served as biology department head, mentored more than 10 graduate and 40 undergraduate students, and served in a number of interdisciplinary administrative roles while also managing an active research lab with more than $3 million in funding from the National Science Foundation, National Institutes of Health, U.S. Department of Agriculture, and other agencies. He is also an elected fellow of the American Association for the Advancement of Science. 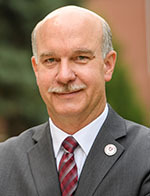 DeWald joined Washington State University in 2011 as dean of the College of Sciences and was quickly tasked with facilitating the merger of the College of Liberal Arts with the College of Sciences to form the new WSU College of Arts and Sciences. He was appointed as the founding dean in 2012. Over the past five years, in addition to managing a $100 million budget, facilitating disciplinary excellence across 20 academic programs, and supporting a robust research portfolio, he has served as a leading member of the WSU team responsible for implementing University-wide retention initiatives such as the Student Success Collaborative, the Mathematics Learning Center, and professional advising for students in pre-law and pre-health programs. “It may sound clichéd, but it’s rewarding to be able to invest in people and programs and help build an organization that enables student success—and to be part of something bigger than any of us could make on our own. I’m impressed by the commitment of the state and the University to develop WSU Spokane and the potential we have to truly make an impact on healthcare across the region.” – Daryll DeWald, chancellor. His wife, Rebecca, is a cardiac nurse at Providence Spokane Heart Institute and the youngest of their three children, Diana, attends Whitworth University. The DeWalds’ son, Derek, is a captain in the U.S. Air Force and their daughter Laura is a biochemist.